I saw a post online from a website that I follow, called The Kitchn. I'm a big fan of their posts and website. Most days I find several things or ideas well worth giving a try. One in particular caught my attention - a "cold or cough medicine" for grown ups. It was a variation on a Hot Toddy - lemon, honey and a bit of bourbon, maybe thinned out a bit with some hot water, heated up and swallowed to warm you from the inside. The recipe for this was straight forward, a few tablespoons of each ingredient and then all mixed together and warmed in a microwave. I was immediately reminded of a cough syrup elixir that someone made for Liz, a tincture of fresh ginger and lemon slices put into a small jar and topped with honey. The honey and lemon juices mingle together, creating a light lemony syrup which is then infused with piquant ginger heat. Well, you know what I did? I combined the two recipe ideas and made a whole new bottle of joy! I bought a bag of organic lemons and a big old hand of ginger root. I knew we had some honey that a friend gave to us a while back from her bee hives, and I still had an ample amount of my favorite bourbon, Bulleit Rye Whiskey. I cleaned the lemons and ginger, then sliced them all into small pieces and placed them into a 16 ounce canning jar. Once the jar was packed with lemon and ginger, I poured in the honey. 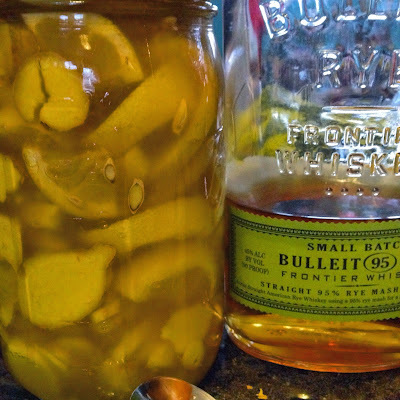 Then, for good measure, I added the whiskey to the honey bottle, swirled it around to get out the honey crystal dregs, then poured the sweet whiskey into the lemon ginger jar. All told, I added about a cup each of honey and bourbon to my jar. Closed the lid tightly and shook the jar a few times to get the honey, lemon juice and whiskey all cozy. Into the refrigerator it went. Wash and clean all the lemons and the ginger and the glass jar. Dry all items. Cut the lemons in half length wise, then slice the lemon halves into half moon slices, about a quarter of an inch thick. Cut the half moon slices into half again. Cut the ginger root into slices, 1/8 to 1/4 of an inch thick. Layer the ginger and lemon slices into the jar, one layer at a time, alternating the layers until the jar is filled to the top, just below the rim of the jar. Press the layers down with the back of a spoon to compact everything. Pour in the honey and then pour in the bourbon/whiskey. Close the lid tightly and shake the jar vigorously a few times to combine all the ingredients and to get the lemon juices flowing. Put the sealed jar into the refrigerator and let the lemons and ginger macerate a few days before using, ideally 2 to 3 days. When ready to use, spoon a few tablespoons into a cup of hot water or tea and enjoy. The lemons and ginger can also be spooned out and placed into your hot toddy or cuppa. 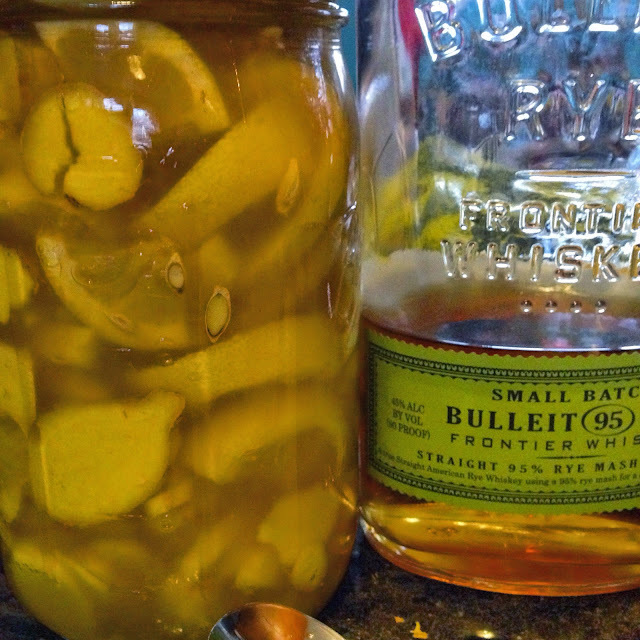 To make more syrup, re-use the lemons and ginger and refill the jar with honey and bourbon or whiskey. The syrup will last indefinitely if refrigerated. 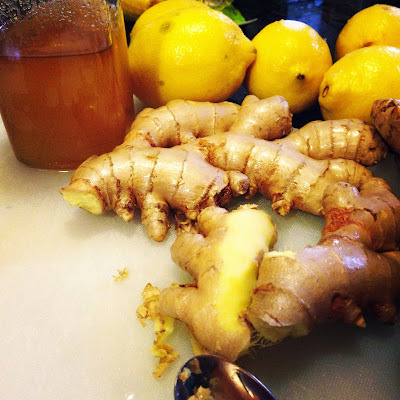 The macerated lemons and ginger will keep, in the jar, in the syrup mixture for up to 1 year.